The Thunder made easy work of the shorthanded Grizzlies in the first half of TNT’s Thursday night doubleheader. Never did Oklahoma City trail in the game — they led by as many as 26 and took it by 17 — as Memphis appeared mired in a post-trade malaise. Kevin Durant led the way with a cool 27, Russell Westbrook had 21, and four more players recorded seven or more. All in all, it was a good night for the Thunder. So why, after an uneven contest in which they scored 106 points, shot 55%, and racked up 25 assists, was the focus on their possible chemistry issues — a subject that typically comes up only on the rare occasion that they lose? Well, Because Russell Westbrook had a bit of a meltdown. It all began with approximately nine minutes to go in the third quarter, when the Thunder led by 25. In an attempt to exploit a mismatch against the smaller Jerryd Bayless, Westbrook was called for a five-second backdown. None too pleased about it, he had words with Thabo Sefolosha, whose unwarranted cut through the lane kind of messed up the floor spacing. 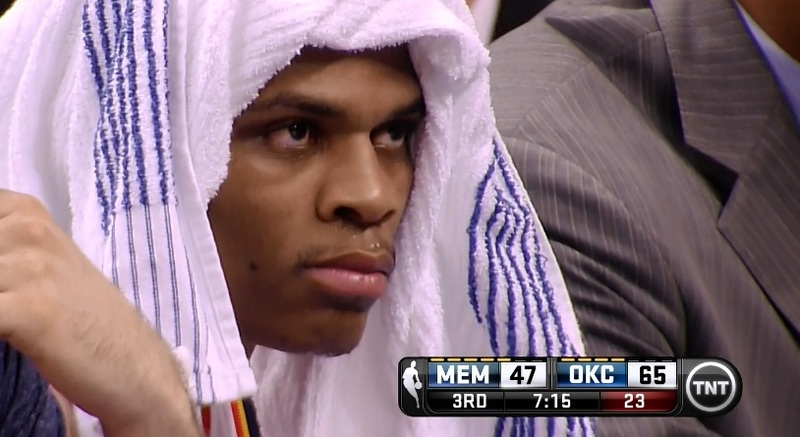 Moments later, Westbrook was taken out for a breather. Despite the play’s insignificant impact on a game that was never close, Russell continued to steam. He proceeded to storm off to the locker room, totally ignoring a small Thunder fan and knocking over a chair on his way. Mo Cheeks, who’d been trying to diffuse the situation, followed him into the tunnel and was eventually able to calm him down. When Russell did reappear, however, he still appeared quite distraught. With eyes red as beets and a scowl on his face, he maintained a blank stare until he finally checked back in for the fourth quarter. After the game, reporters wasted no time in asking Russell exactly what had happened. Not surprisingly, he didn’t take too kindly to Craig Sager’s inquisitiveness. Like a man, Russell? You controlled your temper like a man? First of all, bruh, men don’t say bruh, especially in a disrespectful manner to a fellow man who is only doing his job. Secondly, men don’t throw temper tantrums over such trivial matters as a turnover in a 15-point blowout. Thirdly, men don’t wear shirts covered in cow print and glasses which lack the lenses that give them a purpose. As childish a display as this was, I imagine it’ll blow over quickly both in the media and in the Thunder locker room. Personally, I didn’t even think much of it at first. Though his emotions get the better of him from time to time, Russell has passion that can’t be taught. This passion proves to be an asset more often than not. That said, there are two aspects of this scenario that will justifiably cause it to be perceived in a very negative light — that Westbrook’s anger was directed at his teammate, and that he allowed himself to become so incredibly upset about a petty matter during a game that the Thunder were winning so handily. To me, such intense anger over an inconsequential turnover is a reflection of Russell’s narcissism (and if you don’t think Russell is detrimentally narcissistic then we’ll just have to agree to disagree). Even though the turnover didn’t matter, he was apparently either embarrassed by it (five-second backdown calls aren’t exactly the norm) or furious because it cost him a shot attempt. Either way, it would seem to me as though it was a self-centered line of thinking that led him to become so perturbed with Sefolosha. Obviously, you’d prefer that your point guard had a more altruistic outlook. Then again, Russell Westbrook is better than most points guards. That’s why you put up with this. Right?